A powerful new translation of Nobel Prize winner Hermann Hesse's masterpiece of youthful rebellion&#8212;­with a foreword by James FrancoA young man awakens to selfhood and to a world of possibilities beyond the conventions of his upbringing in Nobel Prize winner Hermann Hesse's beloved novel Demian. Emil Sinclair is a quiet boy drawn into a forbidden yet seductive realm of petty crime and defiance. His guide is his precocious, mysterious classmate Max Demian, who provokes in Emil a search for self-­discovery and spiritual fulfillment. A brilliant psychological portrait, Demian is given new life in this translation, which together with James Franco's personal and inspiring foreword will bring a new generation to Hesse's widely influential coming-­of-­age novel. The Glass Bead Game, for which Hesse won the Nobel Prize for Literature in 1946, is the author’s last and crowning achievement, the most imaginative and prophetic of all his novels. Setting the story in the distant postapocalyptic future, Hesse tells of an elite cult of intellectuals who play an elaborate game that uses all the cultural and scientific knowledge of the Ages. The Glass Bead Game is a fascinating tale of the complexity of modern life as well as a classic of modern literature.­This edition features a Foreword by Theodore Ziolkowski that places the book in the full context of Hesse’s thought. Narcissus and Goldmund is the story of a passionate yet uneasy friendship between two men of opposite character. Narcissus, an ascetic instructor at a cloister school, has devoted himself solely to scholarly and spiritual pursuits. One of his students is the sensual, restless Goldmund, who is immediately drawn to his teacher's fierce intellect and sense of discipline. When Narcissus persuades the young student that he is not meant for a life of self-­denial, Goldmund sets off in pursuit of aesthetic and physical pleasures, a path that leads him to a final, unexpected reunion with Narcissus. 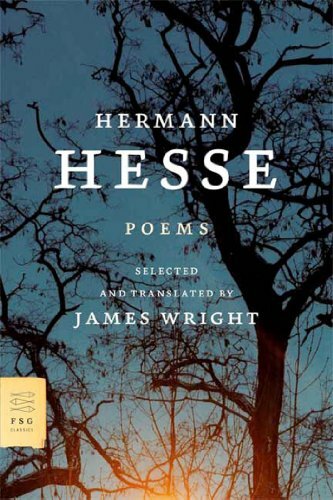 Few American readers seem to be aware that Hermann Hesse, author of the epic novels Steppenwolf and Siddhartha , among many others, also wrote poetry, the best of which the poet James Wright has translated and included in this book. This is a special volume—filled with short, direct poems about love, death, loneliness, the seasons—that is imbued with some of the imagery and feeling of Hesse’s novels but that has a clarity and resonance all its own, a sense of longing for love and for home that is both deceptively simple and deeply moving. Rosshalde is the classic story of a man torn between obligations to his family and his longing for a spiritual fulfillment that can only be found outside the confines of conventional society.­Johann Veraguth, a wealthy, successful artist, is estranged from his wife and stifled by the unhappy union. Veraguth’s love for his young son and his fear of drifting rootlessly keep him bound within the walls of his opulent estate, Rosshalde. Yet, when he is shaken by an unexpected tragedy, Veraguth finally finds the courage to leave the desolate safety of Rosshalde and travels to India to discover himself anew.